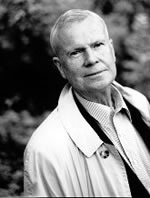 KJELL ESPMARK (b.1930) was Professor of Comparative Literature at Stockholm University from 1978 to 1995 and has been a member of The Swedish Academy since 1981, serving as Chairman of The Nobel Committee from 1988 to 2004. He has published fifteen volumes of poetry, most recently Den inre rymden (The Inner Space) and Skapelsen (The Creation), ten novels, notably Glömskans tid (The Age of Oblivion), and ten volumes of literary criticism. His many awards, both Swedish and international, include The Bellman Prize, The Tranströmer Prize, Il Premio Capri and Il Premio Internazionale Camaiore. He is an officer of L´Ordre de Mérite. Many of Espmark´s poems are dramatic monologues in which the dead, some famous, some anonymous, speak to us, hoping for our attention. Another consistent feature of his poetry, and one which we can see extending over six decades, is the coherence we find within each volume, echoes and cross-references linking poems not only within a single collection but from book to book. ROBIN FULTON MACPHERSON‘s book-length selections in translation include Sekunden överlever stenen, translated into Swedish by Johannes Edfelt, Lasse Söderberg & Tomas Tranströmer (Ellerströms, Lund, 1996); Grenzflug, translated into German by Margitt Lehbert (Edition Rugerup, Hörby, 2008) and Poemas, translated into Spanish by Circe Maia (Rebeca Line Editoras, Montevideo, 2013). A Northern Habitat: Collected Poems 1960-2010 was published in 2014 by Marick Press (Michigan). Macpherson has translated a number of Scandinavian poets, such as Tomas Tranströmer from Sweden (most recent edition 2011), and Olav H Hauge from Norway (most recent edition 2011). See also Four Swedish Poets (White Pine Press, 1990) and Five Swedish Poets (Norvik Press, Norwich, 1997). His most recent translations are from the Swedish of Harry Martinson (Bloodaxe, 2010, Bernard Shaw Translation Prize) and Kjell Espmark (Marick Press, Michigan, 2011 and 2012).